Journeys A Food Lover's Guide To Washington D.C.
Not only is the District of Columbia the United States’ centre of power, its dining scene has gained significant recognition in recent years too. Bon Appetit crowned Washington restaurant city of the year in 2016, and its eateries and chefs are nominated almost every year for the James Beards Awards. Of course, it would be remiss not to mention the attention given to the dining scene by the restaurant-hopping 44th First Couple of the United States. And with Cathay Pacific launching Hong Kong’s only direct flight from Hong Kong to D.C. this September, it will never be easier to get a (literal) taste of being an American political juggernaut. Maydan is a word with roots in the Semitic languages that means “town square”, and stepping into the restaurant makes you feel like you’re right in the middle of one. The centrepiece of the restaurant is undoubtedly the wood-fired hearth, exposed and visible from on all sides of the room. Chefs grill all manner of dishes there, from baby eggplants to whole lamb shoulders. Maydan’s team is already well-known for bringing Georgian food to the D.C. dining scene with their first restaurant, Compass Rose, and Maydan casts a wider net, covering the Middle East, Eastern Europe and North Africa—regions that have often been through conflicts in recent times and underrepresented in the western world. The wine list stays true to these regions, and includes bottles that you’d be hard pressed to find anywhere else, such as those from Israel’s West Bank. Dishes are made for sharing, and the flatbread is replenished generously as you go. Whatever you order, don’t miss the amazing range of condiments—the harissa is exemplary. Located on 14th Street near U Street, perhaps the most happening restaurant row in town, Bresca is gorgeous with its garden-inspired design, and achingly hip. Lest you dismiss it as just a place to be seen, the food is worth elbowing the pretty people out of the way for. With a big focus on local and seasonal (most of the herbs used are grown on the restaurant’s roof), from cocktails right through to dessert, the menu isn’t loyal to any one cuisine—you can follow a leek veloute with a pappardelle with goat and smoked paprika, or even a honey glazed duck with spaetzel to share. A little off the tourist trail in Adams Morgan, this sunny neighbourhood bistro has become one of D.C.’s hottest tables, thanks to its incredibly creative, elevated take on comfort food. You might expect bread-based dishes to be the domain of daytime eateries, but Tail Up Goat has a section of the menu dedicated to refined, sophisticated open-faced sandwiches. Much of the house-made bread is made with ancient grains, and the accompaniments are inspired by European classics, such as chicken liver mousse and preserved plum agrodolce. Pastas are also made fresh at the restaurant, and the combinations are unexpected yet satisfying. There’s also a fantastic wine list, helpfully (and sometimes humorously) annotated to give an indication of the wine’s style. D.C. is believed to have the highest population of Ethiopians in the world outside of Ethiopia. While many Ethnic Ethiopians have since moved to neighbouring Virginia and Maryland, some exemplary Ethiopian restaurants remain in the District, such as Ethiopic, one of the few with a polished approach, showing that “ethnic” food needn’t be restricted to the takeaway genre. Injera, the essential Ethiopian sourdough flatbread made with teff flour, does triple duty as plate, utensil and carb accompaniment to the spicy array of dishes. Ethiopic’s signature is lamb tibs, a dish of fiery sautéed diced lamb with onions, chillis and tomato. You can’t visit the Mid-Atlantic without having a seafood feast. D.C. is, after all, bordered by Virginia and Maryland, the home of the crab cake. Old-school locals will tell you that a crab boil, where you shell and eat an entire a bucket of steaming hot, boiled crabs tipped onto a large table, is an essential experience, but if that’s not for you, a seafood restaurant that celebrates of the bounty of Chesapeake Bay, like The Salt Line, is the next best thing. 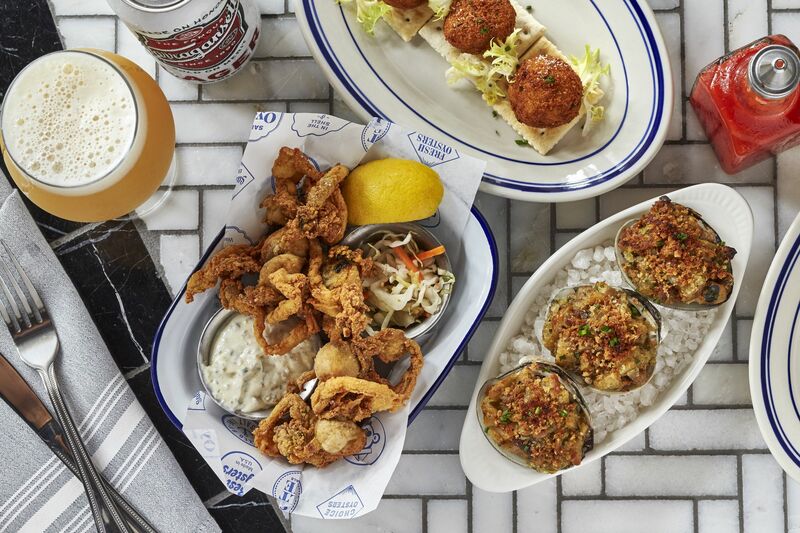 This bright, modern take on a New England pub overlooking the water will satisfy all your seafood cravings, from the oysters and seafood towers of the raw bar, to lobster rolls, crab and fish. The restaurant has partnered with a community-supported fishery of local fishermen who ensure that all the seafood is fresh, sourced sustainably and supports the local community. Talking about D.C.’s dining scene without mentioning José Andrés is almost as bad as forgetting about the Pope at the Vatican. One of the U.S.’s most important chefs today, Andrés’s empire is based in D.C., and you can’t turn a corner in Penn Quarter without seeing one of his restaurants. While all well regarded, Minibar is his flagship fine-diner, where a decidedly modernist tasting menu is offered, and is a spot for a truly special, once-in-a-lifetime kind of evening (and is priced accordingly). More accessible and also representative of Minibar’s modernist tendencies is the adjoining cocktail bar, where you can choose from a cocktail degustation or a la carte drinks. Both Minibar and Barmini are booked via a ticketing system, and book as early as you can, because like any good show, tickets sell out quickly. The classic American diner is a dying breed in many of the U.S.’s bigger cities, so a place like Jimmy T’s, a corner spot in an original red brick house, is a true gem. A typical greasy spoon, a stone’s throw away from the Capitol, they serve breakfast all day, and have a large menu of simple dishes—eggs any way, pancakes, waffles, bottomless coffee, as well as a decent burger. The interiors are a little rundown, the mugs are famously “ugly” and mismatched, and the service is as charming as they come—it’s everything a hipster remake of a diner wants to be, but will never be able to replicate.